While Malaysians may be aware of the concept of recycling, very few of them actually do it. In 2016, the recycling rate was only 17.5% — still some way off from the government’s target of a 22% solid recycling rate by 2020. 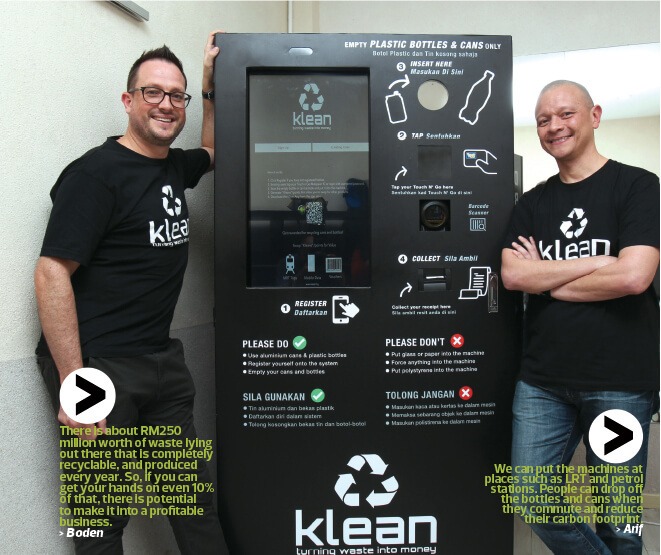 Klean Malaysia Sdn Bhd, a start-up founded by Datuk Dr Nick Boden and Datuk Mohamad Arif Abdullah, is on a mission to boost the recycling rate in the country. They have come up with a unique reverse vending machine (RVM) that accepts used and empty polyethylene terephthalate (PET) bottles and aluminium cans in exchange for non-cash rewards. The project attaches value to every single-use plastic bottle and aluminium can and pays recyclers in Kleans — a virtual currency and e-credit that can be used to purchase goods and services such as mobile airtime, smartcard credit (such as Touch ‘n Go), nano gold and food vouchers. Boden believes that this approach can turn Malaysia into a sustainable circular economy and that the simplest thing would be to focus on two of the most prevalent sources of pollution — PET bottles and aluminium cans. He says there are, conservatively, about 10 billion PET bottles sold annually in the country and only 20% of them are recycled. “This is based on Australia’s statistics, so it is probably more. For aluminium cans, the figure is probably half of that (about five billion units). About 35 million to 40 million tourists visit Malaysia every year, and there are at least two mineral water bottles in every hotel room every day. So, if you do the math, the number of bottles is in the billions. And only a small percentage of that is actually recycled,” says Boden, who is a chiropractor by training. The idea to start the project was not a deliberate one. Boden and Arif, who is a quantity surveyor by training, are also directors of musculoskeletal healthcare company NLB Consulting Sdn Bhd. And one of the corporate social responsibility (CSR) projects they started at the company is called Lend-a-hand, which prints prosthetic arms for children born without hands or functional arms or wrists. “I have been involved in treating spine and joint problems in Malaysia for the last 15 years. One of the things we commonly see is flat feet. So, we invested in 3D printers a couple of years ago with which we could build customised insoles that need plastic filaments,” says Boden. Most of the recipients are children from poor families who are not able to afford the prosthetic limbs. So, the company relies on donations as well as a portion of its profit to cover the cost of producing them. To ensure that the donations are not taken for granted, Lend-a-hand asks the beneficiaries to contribute plastic bottles. “They have to collect 3kg of PET bottles and they have to either show that they had them recycled in their home country or send them to us so that we can recycle them. We then crush the bottles and use them to make the filaments for the prosthetic hands,” says Boden. While he was thinking of how to make the CSR project more sustainable and ensure that his chain of clinics continues to be profitable, Lend-a-hand opened a door that led to the creation of the Klean project. “People got wind of what we were doing and started to drop off plastic bottles at our clinic. Suddenly, we had hundreds of bottles that we did not really know what to do with,” he says. One day, as Boden was watching the news, he learnt that 7 of the 10 most polluting countries in the world are in Asia, and Malaysia was quite high on the list. He started to think about how the country has a linear economy. It was then that the idea of promoting a circular economy was born. Klean is a wholly Malaysian start-up and the founders take pride in this. “The RVM, digital wallet and app are Malaysian designs and intellectual property, owned by a local technology start-up, which is quite rare. We design and produce the machines instead of buying them from China,” says Boden. The latest prototype of their RVM has an aperture that allows users to insert one container at a time. Once they have been scanned and identified, the containers are processed and crushed. The machine allows users to tap their cards and collect points also known as Kleans (100 Kleans = RM1), which are reflected in the digital wallet on its mobile app. Users can see how many Kleans they have accumulated on the vandal-proof screen as well as the app. The machine also uses GPS to allow the app to detect the locations of the RVMs. “There is no barrier to entry as people can use their mobile phones and Touch ‘n Go cards or even their MyKad,” says Boden. Boden says most of the countries with high rates of recycled PET and aluminium are in Europe. First-world countries such as Norway, Sweden and Germany saw the highest rate of recycled PET bottles (93.5%) in 2015 because they incentivise people to recycle. “They have container deposit schemes, which means that that each time you buy a bottle or can, there is a deposit attached to that purchase. If you put the bottle or can into an RVM, you will get the money back. This is the only true way to change behaviour,” says Boden. Project Klean intends to make individual consumers responsible not only for consuming but also recycling. “So when they buy that bottle of water or aluminium can, they will be responsible for what happens to it until it is finished. That means I should be giving it to a place where I know it will get recycled because these are 100% recyclable products,” says Boden. Existing policies and regulations to reduce plastic pollution in the country seem to mostly encourage the substitution of conventional plastic bags with reusable eco-friendly bags. Recycling campaigns, meanwhile, fail to garner active and long-term participation due to the lack of convenience and failure to make economic sense. Boden and Arif acknowledge the public’s indifference to recycling, hence the idea of Klean. “We wanted to promote turning waste into money because there is a value attached to PET and aluminium. There is about RM250 million worth of waste lying out there that is completely recyclable, and produced every year. So, if you can get your hands on even 10% of that, there is potential to make it into a profitable business,” says Boden. Behaviour change, Boden argues, must take place and the most effective way to ensure this is by rewarding recyclers with a virtual currency. “From a social entrepreneurship type of initiative, we wanted to make sure that we are not just enabling bad habits,” he says, in reference to how ineffective RVMs that reward recyclers with coins can be in poorer communities. “If you get 10 cents, you will only need 70 cents to buy a cigarette. So, that is not necessarily a good thing. We want people to be able to build up points and be able to swap recyclables for valuable things. So, we came up with a kind of virtual currency,” says Boden. He adds that Klean could potentially replace loyalty or reward programmes. He argues that unlike these programmes, Klean has an environmental angle to it as it is linked to recycling as opposed to buying things. “Loyalty schemes are based on the consumer model. The more things you buy, or the more flights you take, the more carbon you produce, the more you are rewarded. This is a very linear approach,” says Boden. Klean is now working with Digi Telecommunications Sdn Bhd, which is 50%-owned by Norwegian company Telenor. And Norway has very strict requirements in terms of carbon footprints and recycling, says Boden. “Digi is under pressure to make sure its sustainability reports are good and it understands what we are doing. So, we are partnering the telco to enable recyclers to get prepaid data, for example. We are currently doing all the back-end integration with Digi,” he adds. Another way to benefit from Klean is by using smartcard credit such as Touch ‘n Go cards. Klean is also looking to allow people to use the recycling of plastic and aluminium to offset public transport costs. “We want to enable people to go to the MRT station, put five bottles into our RVM, tap their radio-frequency identification (RFID) card and get to pay for half their journey,” says Boden. He adds that Klean wants the project to have a significant social impact and its target is the B40 (bottom 40% of the income groups) households. “We want to create a sustainable business that has a large impact on poor people. But it is also completely okay for people who have money to participate. We are trying to Uber-ise some of the components. Arif says that despite the numerous delivery centres for recyclables, they often require people to drive there and deposit the materials. “But just the act of driving to the recycling centre increases your carbon footprint,” he points out. Klean’s RVMs, however, will be placed in areas that have been selected for their convenience. “We can put the machines at places such as LRT and petrol stations. People can drop off the bottles and cans when they commute and reduce their carbon footprint,” says Arif. For big corporations, the RVMs provide a good return on investment as there are tax incentives for investing in green technologies. Klean’s machines will be Global GreenTag certified, making them tax deductible, says Boden. “It is a CSR-marketing hybrid because for sustainability, we are also looking at digital marketing. Our machines are powered by large, high-definition displays that are online all the time. We are also talking to digital marketing companies to allow us to stream advertising on the display,” he adds. Klean is in talks to partner the MyKasih programme, which drives welfare distribution for the less fortunate, to use a cashless payment system that allows recipients to shop for basic necessities using their MyKad as a payment tool at designated retail outlets. It is also tying up with gold trading platform HelloGold, which has a cryptocurrency called GoldX, to allow people to turn plastic and aluminium into gold. The move aims to empower poor people who do not have access to credit, says Boden. “One of the things that keeps people in poverty is the lack of access to credit. A lot of people have money, but they are not in the formal sector and they do not pay tax. They do not have bank accounts, much less a three-month bank statement,” he points out. For now, Klean focuses on building the ecosystem for the project to show the public how it works. It is working on the back-end integration with various players and getting investors to help it expand the project. “We just need to get funding and participation from the government and private sector. We want to be able to put a few RVMs at easily accessible places,” says Boden.